The VocoPro DVD-DUET is an 80W multi-format music/vocal system designed as an all-in-one karaoke system for parties and special events. It features a top-loading shock-resistant disc player that handles formats such as DVD, CD, MP3, and CD+G. 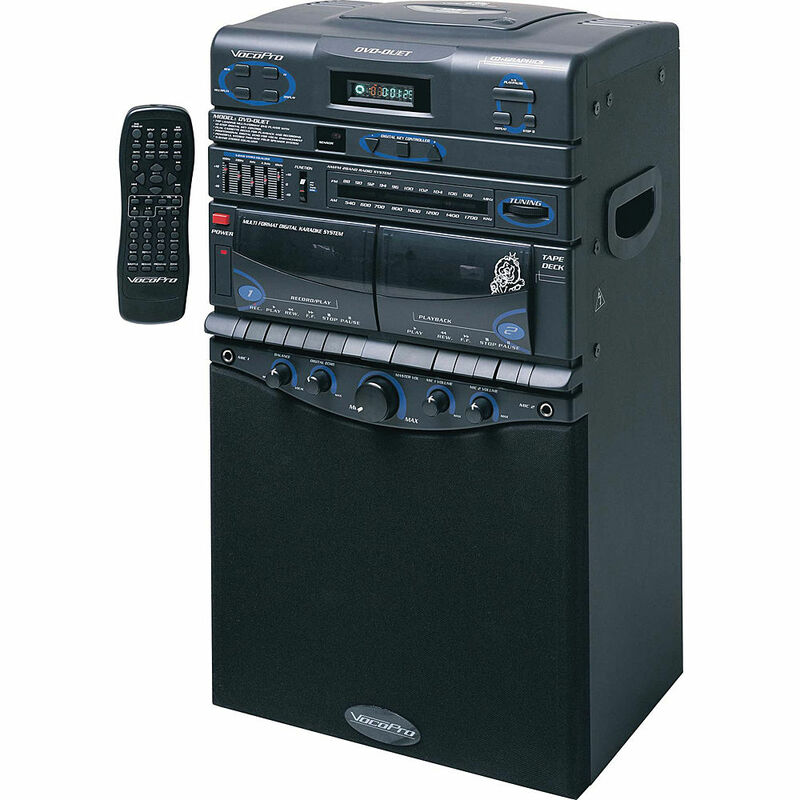 It also comes equipped with dual cassette decks to play and record live performances and mixes from CD or cassette. There's an AM/FM tuner as well. The built-in 2-way stereo system utilizes two 4" woofers and two 1/4" tweeters driven by 40 watts per side. Two stereo pairs of RCA audio outputs are provided for connecting to a larger stereo system and an external recorder. NTSC- / PAL-switchable video outputs include an RCA composite connector, RCA component jacks, and an S-Video port. Use the supplied handheld dynamic microphones and mic cables to connect to the 1/4" microphone inputs, each with a dedicated level control. Enhance your sound via adjustable digital echo and the 5-band graphic equalizer. The integrated 12-step digital key controller allows you to easily raise or lower the pitch of CD playback. Box Dimensions (LxWxH) 27.7 x 16.2 x 13.0"
DVD-DUET 80W Multi-Format Music/Vocal System with Built-In Speakers is rated 4.7 out of 5 by 3. Rated 4 out of 5 by Karaoke Junky from Best for the purchase price I absolutely love, love this system! I have been looking for the best price for this system and I have found it with everything I could ask for. Rated 5 out of 5 by P-Bone Phil from I'm Happy Arrived in 6 days. It works great. Rated 5 out of 5 by Richard E from B&H; great products and great people. I keep coming back to B&H because of the great products and great people. I have been a customer since the late 80s. All items in our inventory are new unless clearly stated otherwise on the item's page, or if you are searching on the Used section of our website. Can the cd/mic music be recorded to mp3 or other digital format rather than cassette? With the VocoPro DVD-DUET, users may only record performances onto audio cassette. The audio output however may be used to route audio to an external MP3 recorder. Answered by: BOBBY R P.
Photo shows remote control....overview &amp; specifications does not mention this. does this model come with remote or is the wrong photo shown? The VocoPro DVD-DUET does ship with the Remote Control. Can the music from the cd and microphone be recorded onto the cassettes? When playing back a CD you can record your performance along with microphones to the tape deck.